Two years after he first appeared to skewer 20th Century Fox’s popular X-Men franchise, the so-called ‘merc with a mouth’ Deadpool (Ryan Reynolds) returns in a surprisingly great sequel. Back in 2016 I was not entirely taken with Deadpool‘s scattershot and juvenile approach to humour, or it’s fairly weak story sense, but Deadpool 2 is an improvement in every regard. Between this, Infinity War and Black Panther, 2018 is shaping up to be a pretty outstanding year for comic book movies. 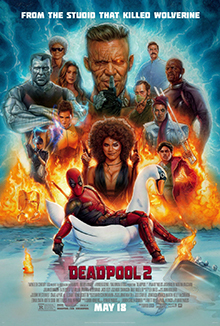 The sequel catches Deadpool trying and failing to join the X-Men, bonding with an angry teenager with pyrokinetic powers (Hunt for the Wilderpeeple‘s Julian Dennison), and fending off attacks from Cable (Josh Brolin) – a hulking murderous cyborg from the future. There is considerably more to the story than that – it’s a surprise to find an honest-to-god three-act structure operating here – but half of the fun of it is seeing how and where it shifts and surprises. The film also does a remarkable job of balancing its overtly crude humour with proper character development and nuance. The bits that aren’t trying to tell jokes give the film a weight and strength that its predecessor lacked. It is trying something a little more sophisticated and difficult this time, and pulls it off brilliantly. The film runs an unexpectedly strong line in action. Director David Leitch (John Wick) takes over from Tim Miller with extraordinary results. Deadpool 2 comes packed with fist fights, sword fights, gun fights, street chases and all manner of other fast-paced, inventive and deftly shot sequences. It works brilliantly as an action film and is a genuinely funny comedy at the same time. That in itself is not unusual, but it’s rare that a movie pushes both action and comedy to such extremes. Ryan Reynolds, for whom this franchise is an admirable passion project, works much better the second time around (third, if you count the execrable X-Men Origins: Wolverine). To a large extent it is because a broader cast of characters exist this time around to share the weight of the comedy. Too much Deadpool can get annoying; Deadpool 2 provides just enough, and spends time developing and showcasing its supporting cast as well. Josh Brolin is pitch-perfect as the time-travelling soldier Cable. Between this and Avengers: Infinity War Brolin is rapidly turning into one of the superhero genre’s strongest assets. I hope Warner Bros notice his efforts: he’d be a sensational Bruce Wayne it they ever adapt Miller’s The Dark Knight Returns. Zazie Beetz plays Domino, a mutant whose power simply involves being very lucky all of the time, and successfully steals one of the film’s key action sequences from both Reynolds and Brolin. She’s got an immediate charisma and appeal in the role, and the screenplay (by Rhett Reese, Paul Wernick, and Reynolds) makes great use of her powers. As troubled teen Russell, Julian Dennison plays things fairly realistic and straight-forward. Even when he is trying to sound tough and threatening, he sounds like exactly that: a teenager trying to sound tough. Deadpool 2 takes the opportunity to expand its cast from the first film, and with it the scale of story. Fans of the X-Men comics are going to enjoy seeing a range of popular (and less well-known) characters brought to life on screen. It’s an expansion that makes sense, particularly with plans already announced to spin things out into an X-Force movie. Admittedly it also leads to a little bit of ‘inside baseball’ from time to time. For anyone not intimately familiar when the extensive X-Men pantheon of characters, it’s best to just shrug and move on. Deadpool was an uneven film that did not quite capitalise on its potential; Deadpool 2 does so and then some. It’s a great action movie, and a great comedy. It’s yet more proof that the Hollywood superhero machine is not in any danger of slowing down – and with films like this, that’s a good thing.